A newspa­per report­s 13 Pakist­anis so far been attack­ed in Bahrai­n this week. As Bahrain’s security forces cracked down on protesters in Manama on Wednesday, Pakistani labourers in the capital found shelter with friends and at community centres in the capital. 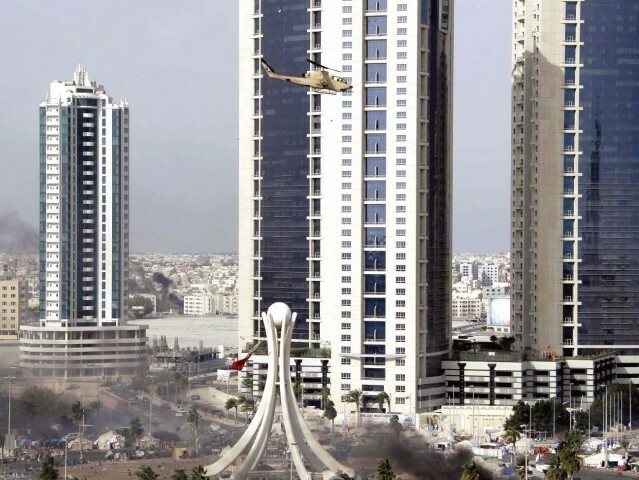 The Gulf Daily News newspaper reported that 13 Pakistanis had so far been attacked in Bahrain this week. One Pakistani was killed on Sunday. The naturalisation of foreigners in Bahrain is viewed as an attempt to change the demographic of the population, which is largely Shia. Protests against the naturalisation of foreign workers in Manama took place earlier this month. Opposition activists estimate that up to half of Bahrain’s national security apparatus is made up of Sunnis from Jordan, Yemen and Pakistan. The Pakistan Embassy in Manama was closed on Wednesday, said an employee who answered the phone. He said it would re-open on Thursday. Protesters in Bahrain blame Pakistanis in their security forces for ‘excessive violence’. Pakistanis living in Manama claim Malik was killed by protestors. Violence leaves three people dead as Manama recalls envoy from Tehran. Pakistanis are mercenaries for the Dictators. Just like the Mali mercenaries used by Gadaffi t kill Libyans. Freedom will overcome. Shame shame shame on you!.. One question if you stood out there in Manama Souq; and saw 10 Bahraini People! can you tell who is Shia and who is Sunni? you cant! I dare you I am a bahraini and I cant tell the difference! so why would you lie and say that those who kil…led are Shiaa? you saw them with your own eyes? and you knew who they were? and also you were so clever to know their religious backgrounds!?? who paid to them to say such words? in response to real Bahraini; it does not matter killing and violence is not acceptable whether Pakistani, Indian, Bahraini in the end we are all humans! now if a Pakistani village was attacked; and they identified a Bahraini who was leading the attack; can we say all Bahraini are bad and killing all Pakistanis !